One of the things that makes the Bald Cypress swamps so neat is that they're covered in Spanish moss. The moss hangs down down off the tree limbs and in the fall, when they lose their color it creates this very ghostly scene. 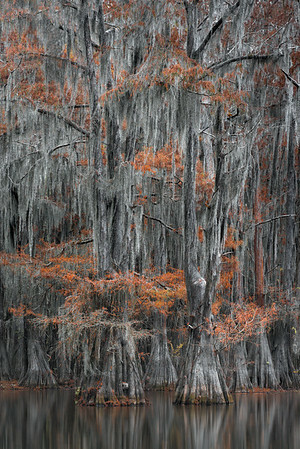 When the Bald Cypress trees themselves start changing colors it creates a neat dichotomy of red on white. Willie, Carolyn, David and I shared this lake with a group of workshop students but for the most part never interfered with each other. We started early, while the morning was still pitch black, and arrived at the grove just as light was starting to seep in. With such little light we would paddle the kayaks to the shore, hop out, secure the kayak, and then mount the cameras onto a tripod. Eventually it got light enough that we could hand-hold our photos from in the kayak. It certainly made it much easier to take photos -- and quicker to explore and photograph a number of scenes. This photo, however, was my last photo that I took with the tripod. I spotted it just as the rest of the crew switched to hand-holding, and I loved the way these trees lined up their trunks but their big branches seemed to disappear into a tangle of moss heaven.